Health Testing - Irish Wolfhound Club of America, Inc.
"Health testing" is often used to refer to screening for inheritable medical conditions, but we use it to refer to all testing that can benefit the health of our dogs, as individuals or as a breed. It can mean testing to identify affected individuals for treatment purposes, breeding decisions, or in conjunction with scientific studies or health databases, or direct genetic testing to identify dogs who have an increased risk of either being affected by a condition or passing it along to the next generation. It is important to remember that testing is important for all Irish Wolfhounds, not just those who are used for breeding. Early detection of changes in health often leads to a better quality of life for your dog. All Irish Wolfhounds may benefit when your dog participates in a health study that increases our knowledge. 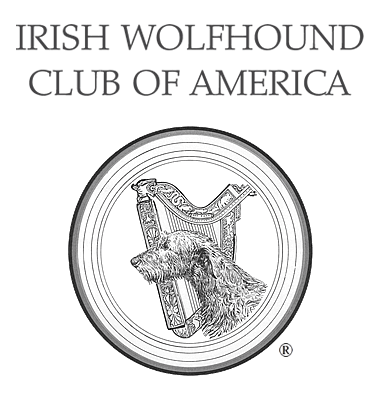 The IWCA recommends screening all adult Irish Wolfhounds for congenital and developmental heart disease (EKG), congenital eye disease, hip dysplasia and elbow dysplasia. Heart and eye exams should be performed annually if a dog is being bred, and since direct genetic testing is not available for most diseases, knowing more about dogs in the pedigree, including siblings, enhances the breeder's ability to make informed breeding decisions. Screening can also be done for von Willebrand's disease and thyroid imbalances, which sometimes occur in Irish Wolfhounds. It is important to know that the screening tests and registries available do not cover all the health concerns of our breed. Research to improve detection is constantly ongoing and may take many years to yield results. The Irish Wolfhound Foundation offers subsidized cardiac screening at IW specialties in the US and Canada. All-breed canine health clinics offer cardiac, eye, and other screening for reduced costs (clinic schedule compiled by the Cavalier Health Organization). Cardiac screening in IWs should always be performed by a Board-certified veterinary cardiologist; eye screening by a Board-certified veterinary ophthalmologist. Puppies should be screened for liver shunt (also called portosystemic shunt, or PSS) before going to their new homes. PSS testing is a simple blood test can be done by the breeder's regular veterinarian. Testing alone is not an assurance of good health. Your breeder should be willing to share the health history of the parents and their siblings as well as other dogs in the pedigree. You need to be aware of what is normal for your dog and be alert to changes in exercise patterns, eating habits and sleeping habits. Wolfhounds are often slow to complain about pain or sickness, being a strong and stoic breed.